Tomorrow is Albert Einstein’s birthday. 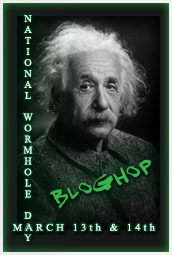 In celebration Stephen Tremp, Laura Eno, and Luanne Smith have put together the National Wormhole day blog hop. The premise is simple. In 100 words or less tell What you would do or where would you go if you could traverse a wormhole through space or time just once? Personally, I'd love to go to the future. My husband and I have been watching Star trek: The Next Generation and it's been really fun to see what they predicted as future technology. In some ways, we've passed up the technology on The Enterprise and in other ways we have a long way to go. If I could jump through a wormhole, I'd like to observe how the people live. Then I’d write a book about it passed off as fiction. I’ll be laughing in my grave as all of my ‘predictions’ come true. If you could make up one piece of technology for the future what would it be? Sneaky! People would think you were a prophet. The future is my choice as well. Love Next Gen! I would also be interested in seeing what technology exists. Alex is right-- people would think you were a prophet! That's awesome. Oh, wouldn't it be cool if you could finally say "beam me up," and they do it!! That would be so cool. The future is the hot place during this blog hop. I hope we get lapel communicators soon. Perhaps Nostradamus did the same thing? But he went too far to disguise the real source of his info. I'm 98% sure that's what Jules Verne did. My invention would be a serum that would allow us to remain looking youthful our entire lives (vanity is a money maker). However, we would all still die around 100 years old or you get into some serious overpopulation issues. That's a good one. Make people believe you're psychic. That's one way to get the last laugh. Seems like a lot of writers would enjoy observing the future. It's good fodder for our novels! Also loved the Nest Generation! I live in Vegas so...I would go to the past, and get a sports almanac like BACK TO THE FUTURE and milk this city for all it's worth! Just kidding. But seriously, I would. Good plan. They might think you're book is outrageous and unbelievable though! Technology I'd like to see is... a surgical tool that repairs deep inside the body without any incisions or marks - an osmosis type of tool. We're always amused, when we watch old SF movies or read old SF books, by all the ways authors think the future will change rather than all the ways they never imagine. Still waiting for our flying car, but where would we be without the Internet? I would create a language translator that was worn in the ear and could identify any language in seconds, so people could talk to one another. I know, kinda hokey, but that is a problem with people from different worlds. Great choice! And I don't think that would be cheating. Callnkt an advanatge you havenon everyone else. And thanksnfor participating. Smart move J.A. You'd be sitting on a best seller! ooh! Now that is sneaky-smart! Definitely, write a book about it! If I went into the future I'd want some type of technology that would clean my house for me! Maybe a robot maid or something, lol. Sneaky way of become Nostradamus but I want that book! I'd love to go into the future too. My soft sci-fi books have been on hiatus for far too long. The one I got furthest into and want to revisit first starts in 3001, when teleportation is the primary mode of transportation and there are space colonies as far out as Jupiter. One kind of lame future invention I thought up a long time ago was for my fellow eczema sufferers. It was kind of like a Newton (a sort of iPad 20 years ago), with an image of the body on it. If you were in class or something and couldn't scratch yourself, you'd just tap on the afflicted part of the body and it would be itched for you. I suppose thinking up an actual cure for eczema didn't occur to me! Hahaha, that would be awesome! It's funny how some of the things in the show can look outdated by what we actually have today. At the rate things are going, I'll bet even just 5 years in the future technology will be vastly different than it is today. Very amusing, Jennie. That would be pretty cool. If I could make up one piece of technology for the future, it would probably have to do with sustainable energy. That's going to be so crucial in this century as the oil reserves dwindle! On a completely unrelated note, I wish that more time travel manuscripts would find their way to my inbox. I love reading them.